Several years ago my wife approached me and asked if I could repair our neighbor’s mother’s dinning room chair. I told here I would give it a try. The next thing I knew I was turning a new leg for a broken chair. 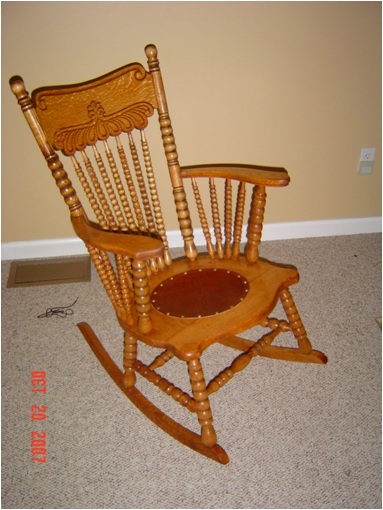 When I was done, the chair looked like new and my neighbor’s mother asked me if I would be interested in fixing her rocking chair. This was my first attempt at a serious restoration. I kept asking myself, ” what have I gotten into?” One of the rocker rails was missing and 14 of the 25 spindles were damaged beyond repair or missing. Yet, there was something about this chair that captured my attention. 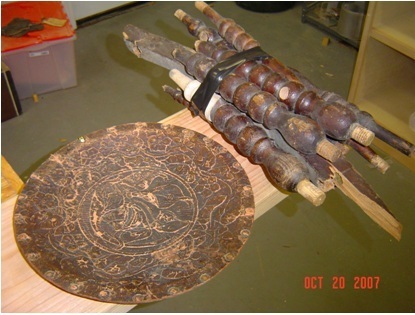 I am not sure if it was the hand carved back, leather seat insert or the spindles themselves that intrigued me. I started our trying to match the wood. I am pretty sure it is red oak; however, the chair was so old the red had faded. I settled on white oak. Itwas the closest match I could find. I purchased a rough cut 8/4 x 6″ x 10″ board from the local mill and started turning spindles. I also had to trace the other rocker rail and duplicate the opposite side. This was difficult since the angle of the sockets (pin and socket construction) was a mirror image. Sanding the old finish off took a lot of time. The good spindles were particularly hard. It took many hours on the lather with sand paper to get down to the original wood. Once all the pieces were replaced the assembly went pretty quickly. I took a scrapped spindle and covered it in different areas with several different stains. I would have gone with a dark stain to try to match the original finish; however, my neighbor’s mother picked a lighter stain. It is the same color that I used on my desk and it is a beautiful finish. The last remaining obstacle was to find a replacement leather insert. This proved easier than I thought. Apparently these leather seats are still commonly used today. It turned out better than I ever expected. My neighbor’s mother was delighted and she paid for all the materials (+$200) and bought me a round of golf at my favorite course. I really hated to give this back. This is truly a unique work of art and I have often contemplated reproducing it but I have not figured out how to drill the holes for the sockets in the base to get the spindles in the right location.